Until now it’s been understood that Presidents cannot permanently withdraw land from production. George H.W. Bush barred drilling off the Pacific Coast, North Atlantic and eastern Gulf of Mexico through 1998. Bill Clinton extended the moratorium through 2008, but this was partly rescinded by George W. Bush. 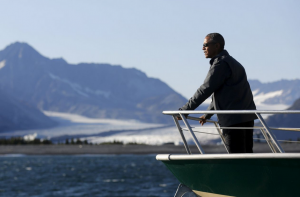 Enter Mr. Obama, who declared that the Arctic and Atlantic offshore areas, while too expensive to develop when oil was fetching $40 a barrel, needed to be permanently off limits “to move decisively away from fossil fuels.” Shortly before leaving office, his Interior Department also tried to tie these lands in a double knot by excluding them from its five-year leasing plan. President Trump rescinded the Obama oil blockade in April 2017, but 10 environmental groups sued. They argue that the Outer Continental Shelf Lands Act does not expressly allow a President to revoke a prior land withdrawal without Congressional approval. Taken to its logical extent this would mean a President can’t undo his own actions. Federal Judge Sharon Gleason last week agreed with the plaintiffs in an outlandish opinion that ignores the law and constitutional principles. U.S. oil prices sank deeper into a bear market Tuesday, posting their steepest fall in over three years and a record 12 consecutive days of declines, as fears of oversupply and weakening demand gripped the market. West Texas Intermediate for December delivery settled 7.1% lower at $55.69 a barrel on the New York Mercantile Exchange, its sharpest one-day fall since September 2015. Brent crude, the global benchmark, was down 6.6% at $65.47, entering a bear market—defined as a 20% drop from a recent peak. Oil’s rapid decline is now fueling worries about weakness in the broader economy. 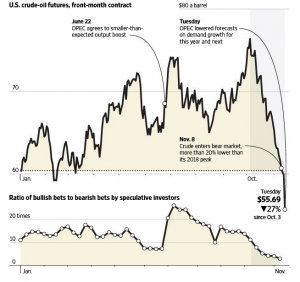 Investors are now questioning whether crude’s plunge could spill over into other markets. The last time oil prices posted such a steep one-day slide, three years ago, crude was in the midst of a rout that eventually dragged down equity prices. Output from OPEC members climbed by 127,000 barrels a day in October. Russia’s production rose 50,000 barrels a day, the oil cartel said in its monthly report. Meanwhile, Iran’s production fell by 156,000 barrels a day. OPEC also lowered its forecasts Tuesday on demand growth for this year and next, citing lower-than-expected demand growth in Asia and the Middle East, along with the uncertain outlook for global economic development. 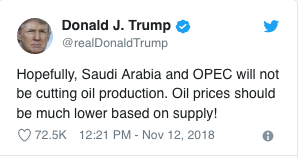 On Monday, a tweet from President Trump added to the bearish momentum in oil prices.